"I-5" redirects here. For other uses, see I5 (disambiguation). For the Wedding Present song, see Interstate 5 (song). Interstate 5 (I-5) is the main Interstate Highway on the West Coast of the United States, running largely parallel to the Pacific coast of the contiguous U.S. from Mexico to Canada. It travels through the states of California, Oregon, and Washington, serving several large cities on the U.S. West Coast, including San Diego, Los Angeles, Sacramento, Portland, and Seattle. It is currently the only continuous Interstate highway to touch both the Mexican border and the Canadian border. Upon crossing the Mexican border at its southern terminus, Interstate 5 continues to Tijuana, Baja California as Mexico Federal Highway 1. Upon crossing the Canadian border at its northern terminus, it continues to Vancouver as British Columbia Highway 99. Interstate 5 was originally created in 1956 as part of the Interstate Highway System, but was predated by several auto trails and highways built in the early 20th century. The Pacific Highway auto trail was built in the 1910s and 1920s by the states of California, Oregon, and Washington, and was later incorporated into U.S. Route 99 (US 99) in 1926. Interstate 5 largely follows the route of US 99, with the exception of a portion in the Central Valley of California. The freeway was built in segments between 1956 and 1979, including expressway sections of US 99 that were built earlier to bypass various towns along the route. 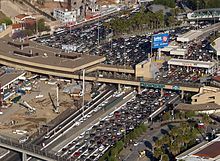 The southernmost point of I-5 is at the Mexican border at the San Ysidro border crossing, one of the busiest in the world. Beginning at the border in San Ysidro, which is part of the city of San Diego, as the John J. Montgomery Freeway, I-5 goes through the suburbs of Chula Vista and National City before reaching downtown San Diego. It then parallels the Pacific coastline, going through the northern suburbs of San Diego, bisecting the University of California, San Diego campus, and passing the I-805 merge (where it becomes the widest Interstate in the United States for a short stretch), before passing through the 28 miles (45 km) of Marine Corps Base Camp Pendleton in northern San Diego County. Here I-5 is also known as the San Diego Freeway. At Dana Point, I-5 turns inland and heads due north through Mission Viejo to the El Toro Y interchange in southeastern Irvine. I-5 becomes the Santa Ana Freeway as it runs southeast to northwest, passing through major cities and suburbs in Orange and Southern Los Angeles counties. Southern Californians refer to it as "the 5" or as the Santa Ana Freeway in the Los Angeles area. From this point, the San Diego Freeway continues northward as I-405. When the freeway reaches the East Los Angeles Interchange one mile (1.6 km) east of downtown Los Angeles, I-5 becomes the Golden State Freeway. The route continues through the San Fernando Valley and then crosses the Newhall Pass through the Santa Susana Mountains into the Santa Clarita Valley. The interchange with State Route 14 (SR 14) is unusual in that truck traffic is separated into its own lanes for both the mainline of the freeway and the transition ramps to and from SR 14. For about a four-mile (6.4 km) stretch between Santa Clarita Valley and the Pyramid Lake, the northbound and southbound lanes separate and cross sides, with the southbound lanes running to the east of the northbound ones. At that point, the Golden State Freeway rises sharply to the north through the Grapevine to eventually reach the second-highest point of its entire length, the Tejon Pass (elevation 4,183 ft or 1,275 m). Through the Tehachapi Mountains. Path 26 power lines generally follow the freeway along this stretch. The freeway then descends sharply for 12 miles (19 km) at Tejon Pass to around 1,600 feet (490 m) at Grapevine near the southernmost point of the San Joaquin Valley, approximately 30 miles (48 km) south of Bakersfield and 4 mi (6.4 km) south from where SR 99 splits away from it in Wheeler Ridge. From SR 99 to south of Tracy, I-5 skirts along the far more remote western edge of the great Central Valley, and thus here is removed from population centers such as Bakersfield and Fresno; other state highways provide these connections. This part of I-5 is known as the West Side Freeway, and is a major connector between the San Francisco Bay Area and Southern California. I-580 splits from I-5 at a point south of Tracy as the West Side Freeway Scenic Byway, the last stretch of the West Side Freeway—providing a loop-route connection to the San Francisco Bay Area. East of Tracy, I-5 intersects with I-205, another freeway that links I-5 to the Bay Area and passes through Tracy. After passing Tracy, I-5 heads north through Stockton and Sacramento before turning west to Woodland. At Woodland, the Interstate heads northwest again towards Dunnigan, where it converges with I-505. From Dunnigan, I-5 skirts north along the western edge of the Sacramento Valley to Red Bluff. I-5 then enters the Shasta Cascade region, passing through Redding and Shasta Lake before climbing up to near the foot of Mount Shasta. The interstate then travels to Weed and Yreka before reaching the Oregon border. About three miles (4.8 km) north of the California border, the highway crosses 4,310 feet (1,310 m) Siskiyou Summit, the highest point on I-5, and then drops down into the Rogue Valley through Oregon's southern mountains and towns such as Ashland, Medford and Grants Pass. Turning north across three passes to the Umpqua Valley and through Roseburg, the mountains tend to turn into hills, and as it reaches Cottage Grove, the road enters the Willamette River Valley. At Eugene the highway intersects I-105, a short spur route into Downtown Eugene. Some city highways intersect on I-5 in the Eugene Metro. The Interstate then heads almost due north, skirting Albany and Corvallis, passing through Salem, and crossing through Woodburn. There were plans to build a spur, called I-305, into Salem. I-5 covers 308 miles (496 km) in Oregon. Just north of Salem, between mile markers 259 and 260 just short of mile marker 260, signs in the median and on both shoulders mark the place where the 45th parallel crosses I-5. It reads "45th Parallel half way between the Equator and the North Pole". The highway then tracks a little to the northeast, and I-205 splits off south of the Portland metro area. From here I-5 passes through Tualatin and Tigard along former U.S. Route 99W (US 99W) before hitting the southern terminus of I-405 and the Marquam Bridge. Also planned was a spur in Portland off I-405, called I-505, but it was never built and has been removed from city plans. A stub of I-505 exists as a long exit ramp to US 30. After crossing the Willamette River on the Marquam Bridge, I-5 has junctions at the western end of I-84 and the northern end of I-405. It then continues through the northern parts of the city of Portland, and crosses into Washington via the Interstate Bridge. The highway continues over the Columbia River and drops down into the city of Vancouver. About seven miles (11 km) into the state, it reaches the northern terminus of I-205, which is on the eastern edge of the Portland–Vancouver metropolitan area. It then tracks north by northwest through Woodland to Kelso and Longview, at which point it ceases to parallel a large bend of the Columbia River. Continuing north between the Willapa Hills and the Cascade foothills, the freeway eventually reaches Olympia, where it bends sharply east. The highway passes though the northern end of Joint Base Lewis-McChord (formerly Fort Lewis and McChord Air Force Base) and Tacoma, where it bends sharply north again to reach Seattle. The Ship Canal Bridge carries it over Portage Bay in Seattle. The freeway continues north out of the Seattle–Tacoma–Everett metro area, crosses the floodplains of three rivers, through the Skagit Valley and the Mount Vernon–Burlington Metropolitan Area to the northern city of Bellingham, to arrive at the Peace Arch Canada–US border crossing between Blaine, Washington, and Surrey, British Columbia. Highway 99 continues northwest from the border into Vancouver, BC. I-5 covers 277 miles (446 km) in Washington. The shield for U.S. Route 99. A section of the 1915 Ridge Route in Lebec, California, abandoned when US 99 (later upgraded to I-5) was constructed over the Tejon Pass in order to make the travel straighter and safer. An extensive section of this highway (over 600 miles (970 km)), from approximately Stockton, California, to Portland, Oregon, follows very closely the track of the Siskiyou Trail. This trail was based on an ancient network of Native American footpaths connecting the Pacific Northwest with California's Central Valley. By the 1820s, trappers from the Hudson's Bay Company were the first non-Native Americans to use the route of today's I-5 to move between today's Washington State and California. During the second half of the 19th century, mule trains, stagecoaches, and the Central Pacific railroad also followed the route of the Siskiyou Trail. By the early 20th century, pioneering automobile roads were built along the path of the Siskiyou Trail, notably the Pacific Highway. The Pacific Highway ran from British Columbia to San Diego, California, and was the immediate predecessor of much of US 99. The route of US 99 was in turn used as a basis for much of the route of today's I-5. A major deviation from the old US 99 route is the Westside Freeway portion of I-5 in California's Central Valley. To provide a faster and more direct north-south route through the state, the decision was made to build a new freeway to the west and bypass Fresno, Bakersfield, and the rest of population centers in the area instead of upgrading the existing highway (which was re-designated as part of SR 99). This re-route through California's Central Valley was the last section of I-5 to be constructed, with the final segment dedicated and opened to traffic near Stockton, California, on October 12, 1979. Representatives from both Canada and Mexico attended the dedication to commemorate the first contiguous freeway connecting the North American countries. This direct route also bypasses San Francisco and the rest of the San Francisco Bay Area. Original plans called for a loop Interstate with a directional suffix, I-5W. This route now roughly corresponds to I-580 from I-5 south of Tracy to Oakland, I-80 from Oakland to Vacaville, and I-505 from Vacaville to I-5 near Dunnigan. 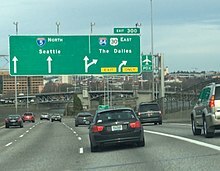 I-5W and most of the other Interstates around the country with directional suffixes were eventually renumbered or eliminated. 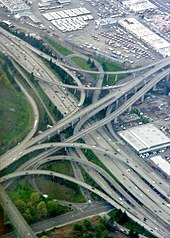 Nevertheless, San Francisco is still listed as a control city on northbound I-5 between SR 99 and I-580. On May 23, 2013, a portion of a bridge on I-5 collapsed in Washington (near Mount Vernon, between Seattle and the Canada–US border at mile marker 228.3), sending two cars into the water and requiring traffic in both directions to bypass the crossing. The Washington State Department of Transportation used a temporary structure to restore access across the river while a permanent bridge replacement was built. That process was completed September 15, 2013. On December 18, 2017 an Amtrak Train derailed by an overpass on I-5 near Tacoma, Washington and blocked several lanes of traffic. Looking South at I-5 and I-90 meeting in Seattle. Aerial view of the San Ysidro border crossing on the Mexican border, marking where I-5 continues south at Mexico Federal Highway 1. 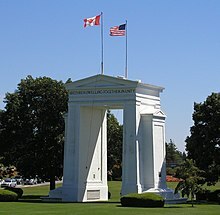 The Peace Arch monument on the Canadian border, marking where I-5 continues north as British Columbia Highway 99. I‑10 in Boyle Heights. The highways travel concurrently through Boyle Heights. I‑84 / US 30 in Portland. I-5/US 30 travels concurrently through Portland. US 12 south-southeast of Napavine. The highways travel concurrently to Grand Mound. I-5 will have a complete set of auxiliary routes (i.e. 105, 205, 305, 405, 505, 605, 705, 805, 905), with the completion of I-905 in San Diego County. Currently, I-80 and I-90 are the only two Interstates to have complete sets of auxiliary routes. ^ a b Staff (December 31, 2013). "Table 1: Main Routes of the Dwight D. Eisenhower National System Of Interstate and Defense Highways as of December 31, 2013". Route Log and Finder List. Federal Highway Administration. Retrieved March 17, 2014. ^ a b "Museum of the Siskiyou Trail". Museumsiskiyoutrail.org. Archived from the original on April 15, 2012. Retrieved November 27, 2011. ^ Staff. "Timeline of Notable Events of the Interstate Highway System in California". California Department of Transportation. Retrieved March 2, 2014. ^ Valdes, Manuel (May 24, 2013). "'Horrified' trucker watches I-5 bridge collapse behind him". Seattle: KOMO-TV. Archived from the original on June 8, 2013. Retrieved May 24, 2013. Officials warned it could be weeks before things returned to normal along the heavily travelled corridor. ^ Staff. "I-5–Skagit River Bridge Replacement". Washington State Department of Transportation. Retrieved November 29, 2013. ^ Lam, Katherine (December 18, 2017). "Amtrak train derails in Washington state onto Interstate 5; at least 6 dead". Fox News. Retrieved December 18, 2017. Wikimedia Commons has media related to Interstate 5. Wikivoyage has a travel guide for Interstate 5.